My son just got an iPhone5 from Verizon. I got an iPhone5 from AT&T, my wife has iPhone4. 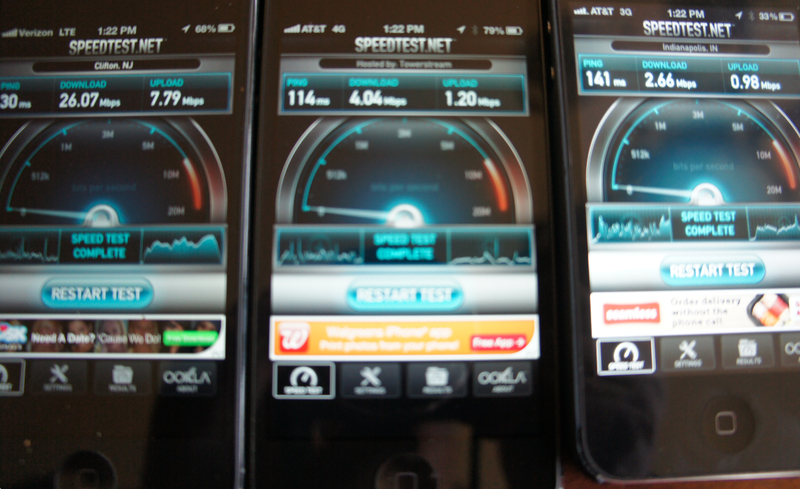 So I put three phones next to each other and ran the speedtests on each of them at the same time. The results speak for themselves. I’m sure the results will vary in different locations – I ran this test in Central Jersey – but Verizon wins hands down. I understand that iPhone4 on 3G is slower than iPhone5 on 4G, but the question is if AT&T has 4G for real or they simply display”4G” to make iPhone 5 owners happy? These test may not be ideal cause for some reason the Speedtest application decided to use different servers for tests. Here’s another interesting observation: while Verizon’s iPhone found the closest symbol in Clifton, NJ, the AT&T test on the photo reads “Hosted by Towerstream”. In test re-run I’ve noticed the message “Using Comcast”. So the question is if AT&T really has their own 4G network or have to borrow the networks from other providers, which is the reason of such slowness? Anyway, it was an interesting experiment, and I hope it’ll help some people in making decisions while selecting their mobile providers.